oops, here is the pix. It looks as though your makefile is missing portions. You may have accidentally deleted a line or something. I'd recommend re-downloading the code file and replace your makefile with the one in the fresh download. Then make the necessary changes for your com port. This is the output when I run make. Notice all the extra lines of output. Thanks, Rick. I have other problems with make now, but i cannot get imgue to upload any image files. Is there another site that I can use for this purpose? Your best bet is probably to get yourself a new copy of the Makefile. That is still the most likely issue here. 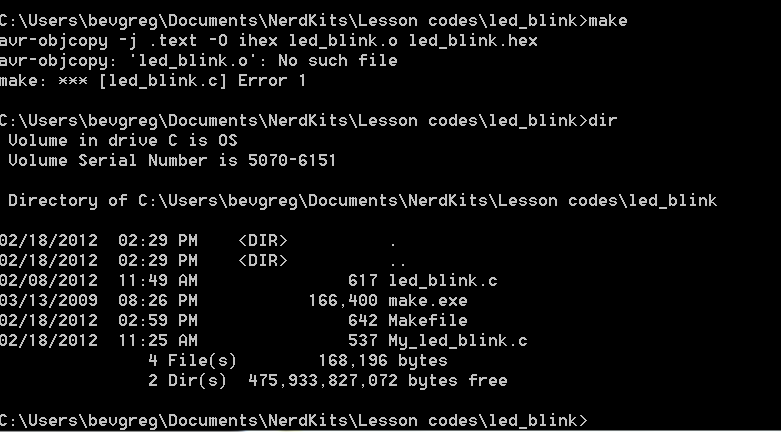 I am a little concerned by the fact that make.exe is inside your led_blink directory. make should be installed by WinAVR and placed in a system path somewhere, not inside each of your project folders. Did you move make.exe yourself? Obtained a new Makefile. make will execute from winavr... directory. The only way I can get it to work is to place it in the same folder as the Makefile, .c. I assume the system path should lead to ...nerdkitscodeled_blink. I guess I could show the results of 'path' entry from winavr... however it does not navigate to 'code'. I added a path from c: ...to 'code' to the path file and make still does not work. At any rate there was an error in my Makefile. With the fresh Makefile, I now get a screen full of errors. I'll display the first few: (I corrected one ...lcd.h was missing a bunch of semi colons. lcd.h is good as is from a clean download. It sounds like winavr is not installed properly. You might try uninstalling and re-installing. Winavr must be installed as administrator in current windows OS's. Just right click the install file and select install as administrator. The other thing I'd do would be to re-download the code.zip file and start fresh with it too. I agree with Rick. It definitely sounds like WinAVR did not get installed correctly. If WinAVR gets installed correctly it will set the system paths so that make, avr-gcc, avr-dude are available from anywhere on the system.